Adding signage to your lectern or stage adds a professional finish to any event, it helps reinforce your brand and message in the most important location, the stage where you audience is paying there attention and in many cases where your event photography will be focused too. For our standard black lecterns a simple 500mm x 800mm foamcore printed sign starts from just $80.00 and don’t worry if you need help preparing the artwork we can help with that too. 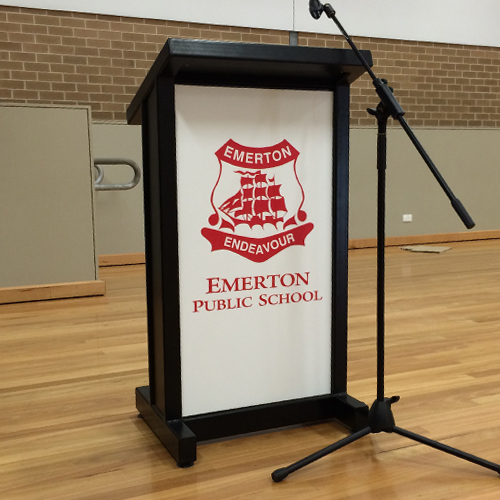 Our perspex lecterns look best with printed decals applied, these start from just $150.00 and the combination of a perspex lectern with printed decal is the best look you can get in a lectern. If your looking for lectern hire or lectern signage check out our Lectern Hire page or get in contact with our team at Structured Events.